My children are moved by music, they always have been. From the time Sydney was a month old she was a “spirited child” who wasn’t easily soothed. I would fight to try to calm her; using soothers, swaddling, rocking and finally…songs. It was the sound of music which got through to her when nothing else would. Today she is 11 years old and VERY much her own person and still is rooted in music. My girls have both been actived in the muscial arts; singing lessons, theatre, ukelale and most recently guitar. They really enjoy their lessons and finding their own sense of style through music. In September, Barbie™ will be encouraging little ones to embrace their inner rock star with the launch of the Barbie™ Rock n’ Royals DVD! In this upbeat musical, Barbie™ stars as Princess Courtney, a modern-day princess whose world is flipped upside down when she switches places with Erika, a famous rock star. The two very different worlds collide when a mistake sends Princess Courtney to Camp Pop and Erika to Camp Royalty. While Princess Courtney and Erika learn to adapt to their different camps, they must come together when they find out both camps are at risk of shutting down. Through this process, they find their true voices, and come together for an epic sing-off that shows anything is possible! Get ready to rock with Barbie™ in the all new upbeat musical Rock ‘n Royals. Barbie™ stars as Courtney, a princess whose world is turned upside down when she switches places with Erika, a famous rockstar. Raise your voice with Barbie™ and become a superstar today! 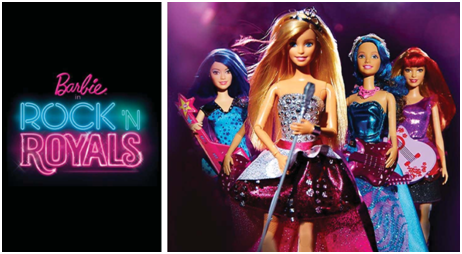 To celebrate the release of the Barbie™ Rock n’ Royals DVD there is an amazing giveaway happening! 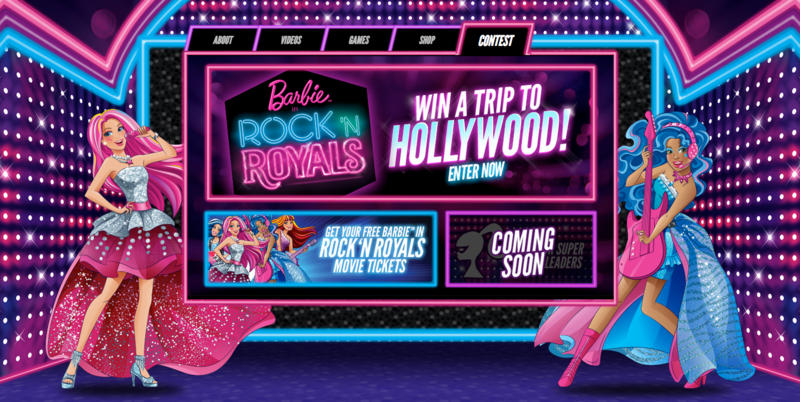 Barbie™ is offering the chance for you to enter to WIN a trip for 4 to Hollywood for a once in a lifetime Barbie™ in Rock ʻN Royals experience! Get the Royal treatment with airfare, transportation, hotel for 2 nights and $500 of spending money as a Barbie™ VIP! Walk the ‘Pink Carpet’, showing off your style on the way to some pre-concert fun with a special guest appearance! Are you ready to rock? 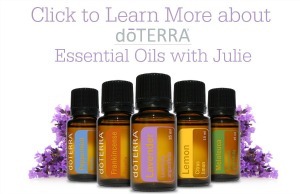 Click HERE to go to the contest entry page…good luck! My friends at Barbie™ have kindly given me permission to giveaway a special Barbie Rock ‘n Royals prize pack valued at $60!! First you go enter the contest listed above (enter HERE) then come back and fill in the Giveaway Tools form below. This is open to residents of Canada (excluding Quebec). You must be 18 to enter, simply fill in the Giveaway Tools form below. Winner will be drawn on July 8th and will have 48 hours to respond. Disclosure: This is a sponsored post, all opnions are my own. We have removed any music from our collection that is a bit to old for our son and encourage him to pick a CD, or vinyl and give it a listen. when he hears a song out he likes we figure out what it is and get him into it. If he sings, hums, dances whatever makes his soul happy. Music encourages me, especially praise music to God. I put music on while cleaning and cooking. I give the grandchildren Itune cards to download their favorites. Being Newfoundlanders we grew up with music playing in our home daily.I always encouraged my kids to listen and enjoy different kinds of music. My daughter loves music and will be starting violin lessons this Fall! I’ve always encouraged my children (and now my little granddaughter) to play music, sing, dance. They’ve always had access to multiple musical instruments, and both my boys play guitar, bass and drums. I am a huge music aficionado and my girls have definitely inherited that trait. I guess it started in the womb! I love to play music to match my mood! I find something so soothing when it comes to music! I find that music is very soothing. I love music and listen to different varieties depending on my mood! Music can lift my mood and inspire me in many ways. Gives me get up and go when I need it, makes me smile when I am singing in the car with my grand daughters, invokes a memory from another time. It can also relax me and fill me with peace. Listening to music always makes me happy and gets my day going. I encourage my nieces and nephews to sing, dance and listen to music that they like. Music is expressive. I am able to loose myself into a good tune. Helps me check out of reality from time to time. Music fills me with energy and positivity. We let Miss R lead whenever she is doing something musical and try hard to keep her interested in her assorted instruments. When my grandkids are here there is always music on for them to dance. LOL This Nana is always getting lessons on how to be dance cool! I’m afraid that I am completely unmusical, which I’ve always regretted but that’s just how it is. My grandchildren on the other hand love their music and are constantly singing songs they’ve heard or dancing around to music. The radio is constantly on when their mother is home, so that probably helps too. We always sing in the car the kids love it. We sing and dance together. I like to try on the tunes when we are cleaning and dance and clean at the same time.